This color selector was created for graphic artists, printers, or any process color (CMYK) applications. 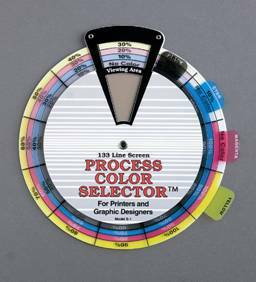 The wheel has four transparent discs tinted in percentages of each of the CMYK colors over a white background, with a window to show you what your color combination produces, This item is an extremely handy tool! The 3453 has a diameter of 6 1/2" and a price of $23.95. 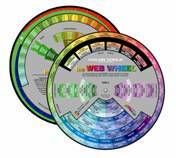 Provides a simple, visual aid for illustrating and teaching color relationships. Includes gray scale, tints, tones, shades, and results of mixing colors. Illustrations of color harmonies (complementary, split complementary, triadic, and more). Defines primary, secondary, warm, and cool colors. Available in pocket, standard, and classroom sizes. An exciting new tool for creating colorful graphics on the Internet! All 216 web-safe colors show HTML hexadecimal codes and RGB values. 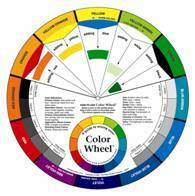 View colors in their natural spectrum to determine color relationships. The price of the 9101 is $9.50. Gray scale, tints, tones, shades, and results of mixing colors. Definitions, basic terms, illustrations of color harmonies, and more. Folds into a compact 3" x 5" carrying case. The price of the 3452 is $3.25. A tool for determining color value in al media. Unique cut-out shapes allow easy viewing and accurate readings. Use to determine the value of black and whites as well as color. The price of the 3505 is $2.95. Designed for watercolor artists! 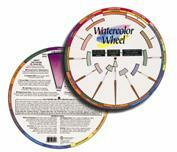 This wheel shows 144 combinations of the most common watercolors to aid in selecting and mixing. It also provides examples of graduated washes along with a wealth of other helpful information. The price of the 3459 is $7.95.